Good morning. I’ve lost track of how many times I’ve started a sermon with, “when I signed up to preach, I thought I was going to talk about [whatever it was] but it turns out that now I’m going to talk about this.” Today is another one of those times. I actually signed up to preach later in Lent, when I figured that my calendar would be a little less full. However, the person who had been signed up for today discovered a couple of weeks ago that they had to travel for work, so I offered to switch. Either way, I thought, since it was Lent, I would give a little history about the origins of the season and how it began as a way for the more seasoned members of the church to be in solidarity with the soon-to-be new Christians who were fasting, praying, and studying the basics of the faith as they prepared to be baptized during the pre-dawn service on Easter Sunday. I figured I could show you some pictures of 6th century baptismal fonts, and struggle to make that somehow fit with this morning’s difficult lectionary texts that seem to celebrate predestination, animal cruelty, invasion, conquest, land theft, and authoritarianism – and that’s just the Genesis reading! However, God’s plans are not our own, and here I am at the lectern ready to talk about something much more immediate and personal. As you may recall, last week during the response period after the sermon, there was a quite strong objection to “Citizens of the Empire of God” as the theme for Lent. The objection was that the concept of empire was all about conquering, displacing, and suppressing, and a strong assertion that these things are not what God is about. While I agree that these are not ideas that I associate with a loving God, I was profoundly hurt by the closing admonition that “language is important,” as the implication seemed to be that we members of Celebration Circle do not recognize the importance of language. In effect, we were being accused of being careless in our choice of words. This was a very painful accusation. Precise language is so important to me that I will often remain silent rather than say something that I have not carefully thought and written my way through. That’s why I almost always preach from a text, because I am wary of saying something stupid when I speak off the cuff. Indeed, this semester, I am teaching a course called “Writing for Worship,” in which I am constantly helping my students see the difference between simple and simplistic, for example; or to understand that calling God “our Grounder,” as one of them did recently, is not quite the same as saying that God is the Ground of our Being. I spend countless hours writing and then editing and re-editing my own books and articles, searching for exactly the right word or phrase to express my precise meaning; and many additional hours working with advanced students, editing their thesis papers so that they, too, can say what they mean clearly and accurately. In Celebration Circle, likewise, we spend many hours each season looking for exactly the right words and combination of words in which the congregation may express its praise and hope as we call ourselves into an attitude of worship, confess our collective sins, celebrate the sacrament of Holy Communion, and share blessings as we depart. So the implied accusation that we do not take language sufficiently seriously was particularly shocking. However, today I am breaking our custom of “no explanations” in order to address not only the comment made during worship last week, but also another communication we received that expressed a passionate rejection of the term “Empire of God” and insisted that we should change the theme to something – almost anything – else, immediately. After long, thoughtful discussion in our meeting on Wednesday night, Celebration Circle decided that although we are more than willing to discuss the objections with those who are distressed, it would be a bad precedent to change the theme. And since I was already on the preaching calendar for today, I agreed to use this sermon time to explain why we chose it and, more importantly, why we stand by it. Creating a new liturgy is one of the spiritual practices of Celebration Circle. This practice begins several weeks before each new season with a brainstorming session in which we consider what we think will be going on in the world, the nation, this geographic/political area, and in Seekers as the new season progresses. Each of us prepares for this brainstorm by reading all the lections for the season in the manner of lectio divina, noting the words, phrases, and ideas that come to us from scripture, and then bringing what has spoken to us in private into the group, where we can all hear one another’s insights from scripture in juxtaposition with our collective thoughts about the world in the weeks ahead. With all the political turmoil around us and issues of migration, asylum, and citizenship in the forefront of many of our minds, the idea that our true citizenship, our true allegiance, is to God rather than to any state or political system, struck a chord. It is as citizens of God’s realm that we can stand in solidarity with the migrants at our border and those who fear deportation, having fled violence and poverty to look for a better life; with dispossessed refugees around the world, who have neither homes nor position nor wealth, yet have equal claim to be participants in the common good; and with people of every sexual, gender, and ethnic identification, who are all human beings with intrinsic, sacred value and worth in the eyes of God. What if, we wondered, we could choose a theme for Lent that did not center on darkness, inwardness, and personal salvation (as Lenten themes so often do) but on our common heritage and mutual responsibilities as citizens of God’s good creation? Our provisional idea for the theme was, not surprisingly, “Citizens of the Kingdom of God.” After all, Kingdom of God is a phrase that is familiar to all of us from years of reading our bibles. It evokes the many sayings and parables of Jesus in which he compares the God’s realm with all manner of surprising and mystifying things. Of course, if we had done that, some of you might have objected to the inherent sexism of kingdom language, or simply stopped hearing how radical the idea of the kingdom of heaven was to Jesus and those around him. So, we continued to struggle with how to convey the sense of surprise that Jesus’ earliest hearers might have felt when they heard him talk about it. During the week following our brainstorming session, each member of Celebration Circle spends some uncounted number of hours leafing through our volumes (or internet sources) of poetry, theology, and other inspirational writings, searching for just the right reflection paragraph to suggest the ideas we have generated together. When we gather on the next Wednesday, we read these snippets of wisdom aloud to one another, going around and around the circle until each of us has offered all the pieces we have brought. Then begins the winnowing, in which we ask one another to re-read this or that passage as we listen intently for tone, for connotations and denotations, and for some felicity of language that makes our hearts sing. Sometimes, this takes a very long time, as this one is rejected because it has only abstract ideas rather than concrete images, that one is passed by because it is too long, and another critiqued for sexist assumptions. Eventually – or sometimes immediately – a passage is read that evokes the unequivocal “yes” that is the sign that, once again and against all odds, the Holy Spirit has guided us to a consensus. 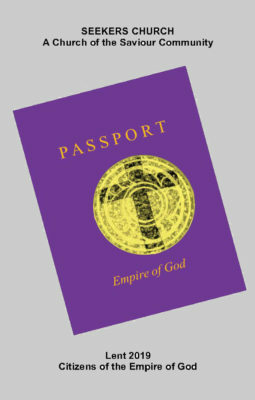 Drawn from James Patterson’s book The God of Jesus: The historical Jesus and the Search for Meaning, this description of the Empire of God as the opposite of what is usually meant by “empire” struck us as surprising and challenging in a way that more familiar terminology generally is not, and we wanted to share that surprise and challenge with you. Early in Patterson’s book, he writes about how we English-speakers came to use the phrase “the Kingdom of God” as a kind of shorthand for a world that is different than the one we live in every day. In that blessed world, everyone has what they need, every tear is wiped away, and there will be no more death’ or mourning or crying or pain. Patterson reminds us (in case we have forgotten) that Jesus spoke Aramaic, not English, and that the New Testament was written in Greek. In Greek, the word that Jesus used when he wanted to talk about both temporal and spiritual power is rendered as Βασιλεία (basilea). The Aramaic word behind that was probably malkutha, which was used in ancient times in much the same way. Both malkutha and basilea were about dominion, not territory; about sovereignty, not nationality. Jesus is depicted as speaking all the time about the basilea of God. Quite naturally, then, this way of speaking has worked itself into the language of Christian faith. The common way of translating the term into English is to use the word “Kingdom.” That is how you will find it in the old King James Version and its descendants, like the Revised Standard Version and its recent revision, the New Revised Standard Version. That translation tradition was very influenced by the olde King’s English, in which one speaks of sovereignty using “kingdom.” But that translation long outlived the King’s English whence it came. It survives today as part of the special antique vocabulary one finds only in the Bible. Now people are beginning to translate it differently, for example, using the neologism “Kindom,” removing the androcentrism of the word “king”—and that is right and good. Some people are translating it as “Reign,” reverting to a Latin base that is at least less recognizably sexist than the English word “Kingdom.” Other are using the word “Rule.” Religious terminology always demands this sort of careful attention. But how would an ancient person listening to Jesus have heard this term basilea? When this word appears in a nonbiblical text from the ancient world it is usually translated as “empire.” It is a very political term. It is the word ancients used to refer to empires, or more precisely in Jesus’ day, the empire: Rome. There was only one empire in Jesus’ world, and that was Rome. Jesus took this very politicized term and attached it to the words “of God.” This was unusual. … the term “Empire of God” (Kingdom of God), contrary to common assumptions, does not appear very often in the literature of the Roman imperial period. But this is understandable. To speak of “empire” is to speak of Rome. And why speak of an “Empire of God,” that is, an empire as God would run it, if one does not have something critical to say about the empire as “you know who” runs it? To speak of an Empire of God would have been risky, to say the least. But Jesus chose this very political, very risky concept as the central metaphor for expressing what he was about. In other words, to speak of basilea, of empire, was just as much about conquering, displacing, and suppressing in Jesus’ day as it is today. For Jesus to speak of the Βασιλεία τοῦ Θεοῦ [Basileia tou Theou], the Empire of God, was to turn the notion of empire on its head. Jesus tells us that the Empire of God is like a mustard seed, like a woman who looks for a lost coin, like a shepherd who looks for a lost sheep, like a manager who pays everyone the same wage whether they started work at dawn or just before closing time, like leaven which raises the whole loaf. Jesus says that the Empire of God is among us and around us and within us, just waiting for us to notice. In the Βασιλεία τοῦ Θεοῦ, in the Empire of God, Jesus tells us, no one lords it over anyone else; all are free to come and go as the Spirit moves them. The political implications are not lost on Jesus when he tells us that in the basilea, the Empire of God, we are to give to Caeser—the emperor – what is Caeser’s; to turn the other cheek when someone hits us; to go an extra mile if a soldier forces us to walk one; or if we are sued for our shirt to give up our coat, also. These vivid examples of what it was like to live under the rule of an oppressive empire tell us that Jesus knew how important it was to choose exactly the right language. Of course, Celebration Circle realizes that not everyone has the time, energy, or inclination to read Patterson’s book (although I heartily recommend it!) or to investigate the overtones and implications of first century Greek and Aramaic. In our mission group discussion about this issue at our last meeting, some of us talked about our own difficulties in making the leap to a new way of thinking about the notion of empire. We are with you, not against you, in this struggle. What we hope – what I hope – is that when you disagree with something we have written, that you take it as an invitation to wrestle with a challenging idea rather than to immediately reject it. Today, we invite you to talk with us, to ask us questions, to be in loving, attentive conversation with us, even if both you and we might get a bit uncomfortable in that conversation. The words that we write, and the words that we put into your mouths to say in worship, matter as deeply to us as they do to each of you. Help us to live in peace together as we take up our citizenship in the Empire of God, which might also be called the Empire of Love, or of Kindness, or of Grace.